Map of the human X chromosome (from the National Center for Biotechnology Information website). Bioinformatics is both an umbrella term for the body of biological studies that use computer programming as part of their methodology, as well as a reference to specific analysis "pipelines" that are repeatedly used, particularly in the fields of nucleic acid and protein sequences. Bioinformatics has become an important part of many areas of biology. In experimental molecular biology, bioinformatics techniques such as image and signal processing allow extraction of useful results from large amounts of raw data. In the field of genetics and genomics, it aids in sequencing and annotating genomes and their observed mutations. It plays a role in the text mining of biological literature and the development of biological and gene ontologies to organize and query biological data. It also plays a role in the analysis of gene and protein expression and regulation. Bioinformatics tools aid in the comparison of genetic and genomic data and more generally in the understanding of evolutionary aspects of molecular biology. At a more integrative level, it helps analyze and catalogue the biological pathways and networks that are an important part of systems biology. In structural biology, it aids in the simulation and modeling of DNA, RNA, and protein structures as well as molecular interactions. Historically, the term bioinformatics did not mean what it means today. Paulien Hogeweg and Ben Hesper coined it in 1970 to refer to the study of information processes in biotic systems. This definition placed bioinformatics as a field parallel to biophysics (the study of physical processes in biological systems) or biochemistry (the study of chemical processes in biological systems). Sequences of genetic material are frequently used in bioinformatics and are easier to manage using computers than manually. Computers became essential in molecular biology when protein sequences became available after Frederick Sanger determined the sequence of insulin in the early 1950s. Comparing multiple sequences manually turned out to be impractical. A pioneer in the field was Margaret Oakley Dayhoff, who has been hailed by David Lipman, director of the National Center for Biotechnology Information, as the "mother and father of bioinformatics." Dayhoff compiled one of the first protein sequence databases, initially published as books and pioneered methods of sequence alignment and molecular evolution. Another early contributor to bioinformatics was Elvin A. Kabat, who pioneered biological sequence analysis in 1970 with his comprehensive volumes of antibody sequences released with Tai Te Wu between 1980 and 1991. Development of new algorithms (mathematical formulas) and statistical measures that assess relationships among members of large data sets. For example, there are methods to locate a gene within a sequence, to predict protein structure and/or function, and to cluster protein sequences into families of related sequences. The primary goal of bioinformatics is to increase the understanding of biological processes. What sets it apart from other approaches, however, is its focus on developing and applying computationally intensive techniques to achieve this goal. Examples include: pattern recognition, data mining, machine learning algorithms, and visualization. Major research efforts in the field include sequence alignment, gene finding, genome assembly, drug design, drug discovery, protein structure alignment, protein structure prediction, prediction of gene expression and protein–protein interactions, genome-wide association studies, and the modeling of evolution. Bioinformatics now entails the creation and advancement of databases, algorithms, computational and statistical techniques, and theory to solve formal and practical problems arising from the management and analysis of biological data. Over the past few decades rapid developments in genomic and other molecular research technologies and developments in information technologies have combined to produce a tremendous amount of information related to molecular biology. Bioinformatics is the name given to these mathematical and computing approaches used to glean understanding of biological processes. Common activities in bioinformatics include mapping and analyzing DNA and protein sequences, aligning DNA and protein sequences to compare them, and creating and viewing 3-D models of protein structures. Bioinformatics is a science field that is similar to but distinct from mathematical biology does with mathematical models. Analyzing biological data to produce meaningful information involves writing and running software programs that use algorithms from graph theory, artificial intelligence, soft computing, data mining, image processing, and computer simulation. The algorithms in turn depend on theoretical foundations such as discrete mathematics, control theory, system theory, information theory, and statistics. The sequences of different genes or proteins may be aligned side-by-side to measure their similarity. 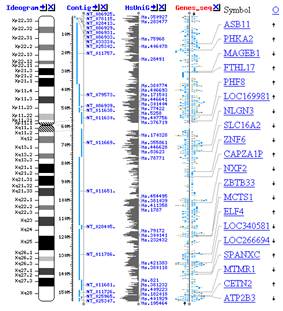 This alignment compares protein sequences containing WPP domains. Since the nucleotides. These programs can compensate for mutations (exchanged, deleted or inserted bases) in the DNA sequence, to identify sequences that are related, but not identical. A variant of this sequence alignment is used in the sequencing process itself. The so-called shotgun sequencing technique (which was used, for example, by The Institute for Genomic Research to sequence the first bacterial genome, Haemophilus influenzae) does not produce entire chromosomes. Instead it generates the sequences of many thousands of small DNA fragments (ranging from 35 to 900 nucleotides long, depending on the sequencing technology). The ends of these fragments overlap and, when aligned properly by a genome assembly program, can be used to reconstruct the complete genome. Shotgun sequencing yields sequence data quickly, but the task of assembling the fragments can be quite complicated for larger genomes. For a genome as large as the human genome, it may take many days of CPU time on large-memory, multiprocessor computers to assemble the fragments, and the resulting assembly usually contains numerous gaps that must be filled in later. Shotgun sequencing is the method of choice for virtually all genomes sequenced today, and genome assembly algorithms are a critical area of bioinformatics research. Following the goals that the Human Genome Project left to achieve after its closure in 2003, a new project developed by the National Human Genome Research Institute in the U.S appeared. The so-called ENCODE project is a collaborative data collection of the functional elements of the human genome that uses next-generation DNA-sequencing technologies and genomic tiling arrays, technologies able to generate automatically large amounts of data with lower research costs but with the same quality and viability. Another aspect of bioinformatics in sequence analysis is annotation. This involves computational gene finding to search for protein-coding genes, RNA genes, and other functional sequences within a genome. Not all of the nucleotides within a genome are part of genes. Within the genomes of higher organisms, large parts of the DNA do not serve any obvious purpose. In the context of genomics, annotation is the process of marking the genes and other biological features in a DNA sequence. This process needs to be automated because most genomes are too large to annotate by hand, not to mention the desire to annotate as many genomes as possible, as the rate of sequencing has ceased to pose a bottleneck. Annotation is made possible by the fact that genes have recognisable start and stop regions, although the exact sequence found in these regions can vary between genes. The first genome annotation software system was designed in 1995 by Haemophilus influenzae. White built a software system to find the genes (fragments of genomic sequence that encode proteins), the transfer RNAs, and to make initial assignments of function to those genes. Most current genome annotation systems work similarly, but the programs available for analysis of genomic DNA, such as the GeneMark program trained and used to find protein-coding genes in Haemophilus influenzae, are constantly changing and improving. The area of research within computer science that uses genetic algorithms is sometimes confused with computational evolutionary biology, but the two areas are not necessarily related. ^ Dayhoff, M.O. (1966) Atlas of protein sequence and structure. National Biomedical Research Foundation, 215 pp. There are several large conferences that are concerned with bioinformatics. Some of the most notable examples are Intelligent Systems for Molecular Biology (ISMB), European Conference on Computational Biology (ECCB), and Research in Computational Molecular Biology (RECOMB). Software platforms designed to teach bioinformatics concepts and methods include Rosalind and online courses offered through the Swiss Institute of Bioinformatics Training Portal. The Canadian Bioinformatics Workshops provides videos and slides from training workshops on their website under a Creative Commons license. Some of the platforms giving this service: Galaxy, Kepler, Taverna, UGENE, Anduril. simplify the process of sharing and reusing workflows between the scientists. enable scientists to track the provenance of the workflow execution results and the workflow creation steps. Basic bioinformatics services are classified by the EBI into three categories: SSS (Sequence Search Services), MSA (Multiple Sequence Alignment), and BSA (Biological Sequence Analysis). The availability of these service-oriented bioinformatics resources demonstrate the applicability of web-based bioinformatics solutions, and range from a collection of standalone tools with a common data format under a single, standalone or web-based interface, to integrative, distributed and extensible bioinformatics workflow management systems. SOAP- and REST-based interfaces have been developed for a wide variety of bioinformatics applications allowing an application running on one computer in one part of the world to use algorithms, data and computing resources on servers in other parts of the world. The main advantages derive from the fact that end users do not have to deal with software and database maintenance overheads. An alternative method to build public bioinformatics databases is to use the MediaWiki engine with the WikiOpener extension. This system allows the database to be accessed and updated by all experts in the field. The range of open-source software packages includes titles such as Bioconductor, BioPerl, Biopython, BioJava, BioJS, BioRuby, Bioclipse, EMBOSS, .NET Bio, Apache Taverna, and UGENE. To maintain this tradition and create further opportunities, the non-profit Open Bioinformatics Foundation have supported the annual Bioinformatics Open Source Conference (BOSC) since 2000. Many free and open-source software tools have existed and continued to grow since the 1980s. The combination of a continued need for new algorithms for the analysis of emerging types of biological readouts, the potential for innovative in silico experiments, and freely available open code bases have helped to create opportunities for all research groups to contribute to both bioinformatics and the range of open-source software available, regardless of their funding arrangements. The open source tools often act as incubators of ideas, or community-supported plug-ins in commercial applications. They may also provide de facto standards and shared object models for assisting with the challenge of bioinformation integration. Please keep in mind that this is a quick sampling and generally most computation data is supported by wet lab data as well. Databases are essential for bioinformatics research and applications. There is a huge number of available databases covering almost everything from DNA and protein sequences, molecular structures, to phenotypes and biodiversity. Databases generally fall into one of three types. Some contain data resulting directly from empirical methods such as gene knockouts. Others consist of predicted data, and most contain data from both sources. There are meta-databases that incorporate data compiled from multiple other databases. Some others are specialized, such as those specific to an organism. These databases vary in their format, way of accession and whether they are public or not. Some of the most commonly used databases are listed below. For a more comprehensive list, please check the link at the beginning of the subsection. Biodiversity informatics deals with the collection and analysis of biodiversity data, such as taxonomic databases, or microbiome data. Examples of such analyses include phylogenetics, niche modelling, species richness mapping, or species identification tools. Computational techniques are used to analyse high-throughput, low-measurement single cell data, such as that obtained from flow cytometry. These methods typically involve finding populations of cells that are relevant to a particular disease state or experimental condition. The area of research draws from statistics and computational linguistics. Other interactions encountered in the field include Protein–ligand (including drug) and protein–peptide. Molecular dynamic simulation of movement of atoms about rotatable bonds is the fundamental principle behind computational algorithms, termed docking algorithms, for studying molecular interactions. Tens of thousands of three-dimensional protein structures have been determined by X-ray crystallography and protein nuclear magnetic resonance spectroscopy (protein NMR) and a central question in structural bioinformatics is whether it is practical to predict possible protein–protein interactions only based on these 3D shapes, without performing protein–protein interaction experiments. A variety of methods have been developed to tackle the protein–protein docking problem, though it seems that there is still much work to be done in this field. Interactions between proteins are frequently visualized and analyzed using networks. This network is made up of protein-protein interactions from Treponema pallidum, the causative agent of syphilis and other diseases. Systems biology involves the use of computer simulations of cellular subsystems (such as the networks of metabolites and enzymes that comprise metabolism, signal transduction pathways and gene regulatory networks) to both analyze and visualize the complex connections of these cellular processes. Artificial life or virtual evolution attempts to understand evolutionary processes via the computer simulation of simple (artificial) life forms. 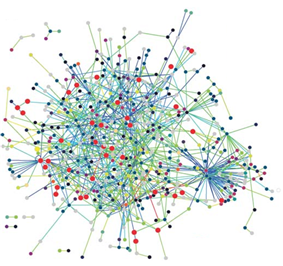 Network analysis seeks to understand the relationships within biological networks such as metabolic or protein-protein interaction networks. Although biological networks can be constructed from a single type of molecule or entity (such as genes), network biology often attempts to integrate many different data types, such as proteins, small molecules, gene expression data, and others, which are all connected physically, functionally, or both. Protein structure prediction is another important application of bioinformatics. The amino acid sequence of a protein, the so-called primary structure, can be easily determined from the sequence on the gene that codes for it. In the vast majority of cases, this primary structure uniquely determines a structure in its native environment. (Of course, there are exceptions, such as the bovine spongiform encephalopathy – a.k.a. Mad Cow Disease – prion.) 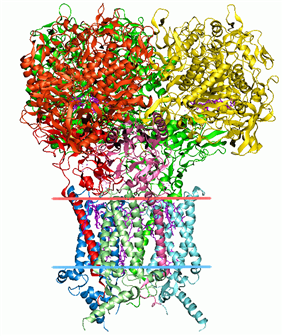 Knowledge of this structure is vital in understanding the function of the protein. Structural information is usually classified as one of secondary, tertiary and quaternary structure. A viable general solution to such predictions remains an open problem. Most efforts have so far been directed towards heuristics that work most of the time. 3-dimensional protein structures such as this one are common subjects in bioinformatic analyses. Regulation is the complex orchestration of events starting with an extracellular signal such as a hierarchical clustering, and consensus clustering methods such as the Bi-CoPaM. The later, namely Bi-CoPaM, has been actually proposed to address various issues specific to gene discovery problems such as consistent co-expression of genes over multiple microarray datasets. The expression of many genes can be determined by measuring mRNA levels with multiple techniques including microarrays, expressed cDNA sequence tag (EST) sequencing, serial analysis of gene expression (SAGE) tag sequencing, massively parallel signature sequencing (MPSS), RNA-Seq, also known as "Whole Transcriptome Shotgun Sequencing" (WTSS), or various applications of multiplexed in-situ hybridization. All of these techniques are extremely noise-prone and/or subject to bias in the biological measurement, and a major research area in computational biology involves developing statistical tools to separate signal from noise in high-throughput gene expression studies. Such studies are often used to determine the genes implicated in a disorder: one might compare microarray data from cancerous epithelial cells to data from non-cancerous cells to determine the transcripts that are up-regulated and down-regulated in a particular population of cancer cells. Another type of data that requires novel informatics development is the analysis of lesions found to be recurrent among many tumors. However, with the breakthroughs that the next-generation sequencing technology is providing to the field of Bioinformatics, cancer genomics may be drastically change. This new methods and software allow bioinformaticians to sequence in a rapid and affordable way many cancer genomes. This could mean a more flexible process to classify types of cancer by analysis of cancer driven mutations in the genome. Furthermore, individual tracking of patients during the progression of the disease may be possible in the future with the sequence of cancer samples. In cancer, the genomes of affected cells are rearranged in complex or even unpredictable ways. Massive sequencing efforts are used to identify previously unknown point mutations in a variety of genes in cancer. Bioinformaticians continue to produce specialized automated systems to manage the sheer volume of sequence data produced, and they create new algorithms and software to compare the sequencing results to the growing collection of human genome sequences and germline polymorphisms. New physical detection technologies are employed, such as oligonucleotide microarrays to identify chromosomal gains and losses (called comparative genomic hybridization), and single-nucleotide polymorphism arrays to detect known point mutations. These detection methods simultaneously measure several hundred thousand sites throughout the genome, and when used in high-throughput to measure thousands of samples, generate terabytes of data per experiment. Again the massive amounts and new types of data generate new opportunities for bioinformaticians. The data is often found to contain considerable variability, or noise, and thus Hidden Markov model and change-point analysis methods are being developed to infer real copy number changes. With the advent of next-generation sequencing we are obtaining enough sequence data to map the genes of complex diseases such as infertility, breast cancer or Alzheimer's Disease. Genome-wide association studies are essential to pinpoint the mutations for such complex diseases. Furthermore, the possibility for genes to be used at prognosis, diagnosis or treatment is one of the most essential applications. Many studies are discussing both the promising ways to choose the genes to be used and the problems and pitfalls of using genes to predict disease presence or prognosis. Pan genomics is a concept introduced in 2005 by Tettelin and Medini which eventually took root in bioinformatics. Pan genome is the complete gene repertoire of a particular taxonomic group: although initially applied to closely related strains of a species, it can be applied to a larger context like genus, phylum etc. It is divided in two parts- The Core genome: Set of genes common to all the genomes under study (These are often housekeeping genes vital for survival) and The Dispensable/Flexible Genome: Set of genes not present in all but one or some genomes under study.